This episode is STACKED! Best of all, we’re kicking things off with an exclusive premiere from the Holophonics! WOAH! This fantastic song will be on their new album out on May 11th. Speaking of new songs we have a brand new song from the Georgetown Orbits off their brand new album! Not only that but I’m following that up with a bunch of songs from a bunch of bands I’m excited to see this weekend at Back to the Beach. It’s gonna be a full-on ska weekend! Fantastic new ska & ska/punk, great older ska & ska/punk! I told you this episode was great! Welcome back to your favorite ska podcast! Wait, this is your favorite ska podcast right? If it is, welcome back! 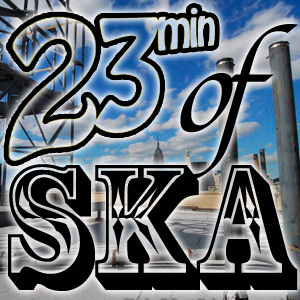 If it isn’t… well, is this your favorite ska podcast that updates every Thursday? It sure is, isn’t it! Well, heck, that’s for listening! Oh, wait, this is the first episode you’ve ever heard? Well, awesome, welcome to the show in general. If you like it there’s 301 more of them back at 23ska.com so go check that out. Oh, and thanks to all of you for listening! Here’s a fat bunch of ska, rocksteady and ska/punk to fill your ears with! A bunch of great songs! Kicked off with a lost-ish/obscure-ish tune from Goldfinger followed by a song that I’ve never been able to shake out of my head from the Forthrights that I was shocked to find I hadn’t previously played on the podcast. Then there’s an older song from the Amphetatmeanies while I wait for their latest album to finally come out! Speaking of new albums, I’ve included a song from the Georgetown Orbits’ new album that should be coming soon! Then we have the Screw-Ups, who are a great band, so check out their EP, every song on it is great! The Boss Beats were a local act out of L.A. that I got to see and I loved them, but they are no longer together, still the music lives on in my heart and on this podcast. We wrap up w/ a song that I’ve had for a while, but misplaced, so thanks to the A-OKS for being so patient, a great group of guys and providing a killer song to boot! I haven’t done a song breakdown like this in a while. I usually refrain from it, as I find it a little dry in some respects, but I understand that not everyone wants to read my take on the philosophies of life like I usually put up. Are you ready for me to shill some ska at you! Here it is, the first time I’ve played any of the songs off of the 7″ records that I made last year. Yes, I’ll admit it, this is an advertisement. I really want you all to know what great songs are on this record! Of course the records will sound a whole lot better, will be full (I made did some editing so everything fits) and won’t have my voice interrupting and talking about things. Hit up www.GrandpasCasino.com and get your set today! Woo! RECORDS! SKA RECORDS! 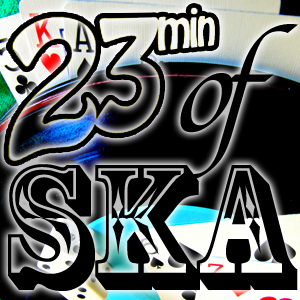 This episode was created to show off the many bands that are taking part in the Big Ska Gamble, a Kickstarter campaign to bring you a 7″ vinyl record subscription club of all ska bands. You get to hear 6 different songs from the six bands represented. These aren’t the songs that are going to be on the records that come out, but good representations of these excellent bands. This episode and all episodes can always be found here. You can also subscribe to the podcast by going to your advanced tab on iTunes, then select “subscribe to podcast…” and entering this address: http://23minofska.podomatic.com/rss2.xml into the box that opens. Also if you’d like, find & like us on facebook. Go ahead and download this episode and throw down with the Big Ska Gamble.